Otto Dix. 1924. Etching, aquatint, drypoint. This year marks the centenary of the commencement of World War One. Having studied the history of the war through the perspective of the British allies it was interesting to view the work of German artist Otto Dix during a recent trip to Berlin. The Der Krieg [War] cycle by Otto Dix confronts viewers with hellish depictions of the Western Front. 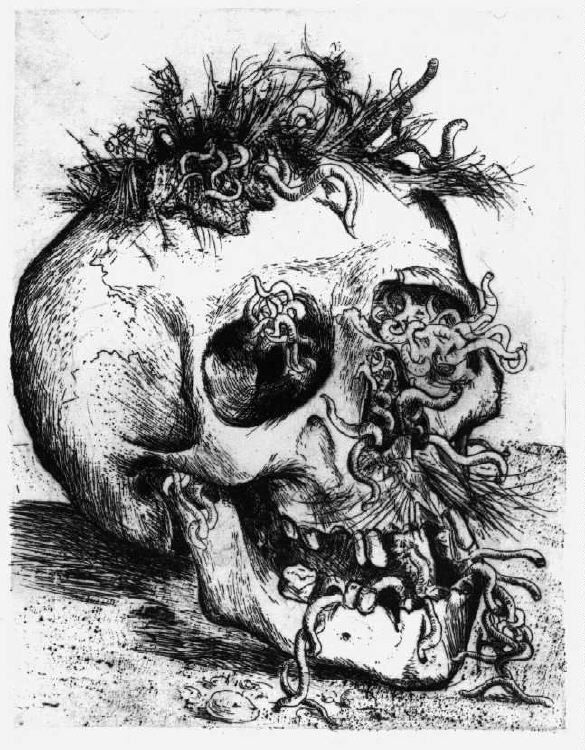 This series of 51 prints depicts rotting corpses, maggots, horse cadavers, ruined landscapes. Dix had experienced many of these images personally while serving as a machine gunner on the Western Front from 1915 onwards. The prints in Der Krieg speak one truth: in war the only victors are the worms. The works in Der Krieg illustrate the misery that was experienced in the trenches. The German figures often appear to be physically and mentally damaged by the effects of the war. The prints contain no sense of nationalistic pride or intent, instead they demonstrate the psychological and physical horror of war. GH Hamilton describes Dix’s cycle as “perhaps the most powerful as well as the most unpleasant anti-war statements in modern art … It was truly this quality of unmitigated truth, truth to the most commonplace and vulgar experiences, as well as the ugly realities of psychological experience, that gave his work a strength and consistency attained by no other contemporary artist“. In Sturmtruppe geht unter Gas vor the advancing stormtroops wear masks whose creases accentuate the worn and weary faces that reside behind them. Emerging through the gas the figures initially look terrifying yet on further examination their bodies are hopelessly emaciated. Their hands resemble outstretched claws, an effect which reduces the soldiers to something less than human. The monochromatic finish of the print suggests the frontline is a world where the senses become dulled, muted. While viewing the print I tried to imagine how the sounds exploding around the trenches affected the soldiers. Was the constant pounding of artillery fire so overwhelming that soldiers on both sides became deaf to the horror? Was it possible to recover from this state? Do modern day soldiers experience the sounds of war differently? It was with these questions that I approached this sonic interpretation of Sturmtruppe geht unter Gas vor. Thanks JD. Another moving sonic interpretation of the visually inspired subjects that you do so well and one that is very relevant in this centenary year of the outbreak of the First World War. I am very familiar with the part of the Western Front around the Somme, an hour’s journey from my home. I’ve stood in the surviving trenches, now beautifully manicured of course, and walked across ‘No Man’s Land’. I can attest that, moving though it is, one simply cannot imagine the real horror that must have taken place here. It is only when looking at the names on the simple and equally well manicured graves in the British, Commonwealth and German cemeteries, all side by side, that one begins to comprehend the utter futility of war. ← Participate in The British Library’s “inspired by” series.